Food that reminds you of comfortable times. Easier times. Yummier times. Times when home cooking was the only kind of cooking. For us, that food is grilled sandwiches and tater tots+ milkshakes. Mmmmilkshakes. With Melt Shop, we set out to make the best damn sandwich on the planet. Period. Next level stuff, made from only the best ingredients, fresh-baked bread every day + the best cheese around. CouponSurfer Rewards members get 10% cash back in-store. To become a free Reward Member, link your credit or debit card for automatic cash back at The Melt Shop + 1000's more restaurants and stores whenever you use your linked cards. 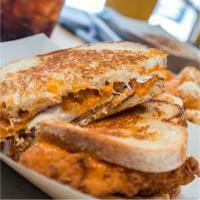 Find a Melt Shop location near you.